John Grossman is the Sales Manager at EcoBuilding Bargains, a CET company, in Springfield, Massachusetts. 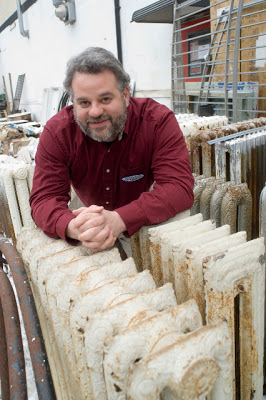 I recently had the opportunity to speak with John about his organization’s deconstruction and reuse business. It’s great to meet likeminded people who share our passion and thanks to the social web, the world is smaller than ever. Thank you to Chris Brogan for connecting us. DRN: John, you have compared yourself to a fisherman. Can you explain? John: Absolutely, especially when it comes to donor acquisitions. The store is the fish shop and it’s my job to perform donor acquisitions. Deconstruction is an important part of our business model. We feel like we can widen the pipe a lot. I started as the manager of the store and deconstruction and as we’ve grown, my job has been chopped into many little pieces. DRN: Do you have other programs besides deconstruction? John: It’s really the donation program and we include deconstruction in that. We have a free pick-up service and we dedicate a lot of resources into that so that we can constantly be locally harvesting those materials. DRN: Does your store sell new or used materials? How do you acquire them? John: We carry both. Each donor relationship is different. Acquiring materials from a retailer or wholesaler of windows, for example, may have surplus for us only once a year. A manufacturer or distributor may sit on their materials longer and let them pile up before donating. A contractor may have surplus too, due to an incorrect order that cant’ be returned, but they represent a steady stream of materials. I talk to contractors all the time who are thrilled to find out about us. Many of them store items simply because they don’t want to throw them away, yet have no idea what to do with them. I explain how we can help reduce waste and the potential tax benefit. It really depends on what they are motivated by – environmental or bottom line benefit. DRN: How big is your store? John: We just moved into a new building in November 2011 and we now have about 32,000 sq ft, in which 20,000 is the retail floor. That is up from our previous building, which was 8,000 sq ft total. It’s a huge expansion for us. The difference between the jumbly treasure chest and a well-organized, wide-aisle, brightly lit store is going to widen the pipeline on shoppers. Shopping shouldn’t have to be an experience for the intrepid. DRN: How many people work at the store? John: Ten people right now. It changes seasonally. We have a receiving staff now, which we didn’t used to have. Now as soon as product comes in, it is processed and priced, and hits the floor in a way that is much more shopping friendly. DRN: What is your favorite part of your job? John: When I was running the whole store and spending more time on floor, I loved the experience of helping someone find just the right thing. Sometimes it was satisfying a whim for architectural salvage and sometimes it was a critical need. A door of an apartment may have been damaged and they needed to replace it immediately. That would be a hardship for some to have to pay full retail. They are grateful for these materials being saved for them to purchase at a huge savings. I loved being able to assist in that type of matchmaking. Now, when I’m out in field for a site visit to a house that’s a prospect for a whole deconstruction, I love closing that deal. You’ve taken probably the single largest waste event that an individual would ever cause and turned it into a positive for the community and the environment. That’s pretty exciting! DRN: How did you discover CET? John: My wife and I moved here from Eastern Massachusetts and bought a house. I was taking a 1st time homebuyer class and CET was distributing fliers to the organization that offers the classes. I went from working on the house and worrying how I was going to afford to fix it up and do all the things we needed to do, to knowing I could get the materials for pennies on the dollar. I started shopping there – a lot. When we e moved here neither of us had a job yet so when my wife noticed the store I loved to much was looking for a manager she suggested I look into it. DRN: Let’s talk about the Deconstruction aspect of your business. John: We are strictly residential because we know that our shoppers are looking for those DIY materials, not commercial items. When we first started there were not that many contractors doing deconstruction. We had to adjust the way people were thinking and working. That is the game changer as far as how much materials can be recovered. DRN: How far reaching is your service area? John: We go to Boston pretty regularly and end to end in the state. DRN: What was your favorite Decon project? John: It has to be the one we did for “This Old House.” The house wasn’t fancy; it was a 1970’s house so the lumber was modern. It had not been put together very well so it was easy to take apart. Going through it in an interview/education mode was very meaningful. I felt like it was an important moment for this industry to be able to tell that story on a national scale. DRN: Decon can be a challenge. What struggles do you face trying to increase it in your area? John: When people just don’t understand it. They think that it’s going to be expensive or time consuming and they don’t want to take a second to thing about how they’re doing things. The fiction that it will take more time or cost more money (which it can sometimes), and contractors who perhaps don’t realize that their clients would like to pay for this. When you meet that new contractor and first you clean out his warehouse and then you become the alternative to the warehouse for him. The more we worked with, the more we saw contractors adding deconstruction services to their business. Most people who can build a house, can take one apart. We have a great donor who we kept hearing about. He was buying and remodeling high-end properties on a regular basis and doing really well. We would contact him but he had no time to talk about it. We kept trying. One time we went to his office and made a presentation. He said, “Oh that’s what you do!” So we proceeded to deconstruct a few houses for him and some soft strip projects, but then it got quiet. I reached out to him and found out he was now doing deconstruction on his own. Now he incorporates deconstruction into how he does business and he calls me every 4 months to come down to his warehouse. I love that! He’s great at saving stuff, he knows what we are interested in and he’s great person. DRN: Single pane windows are challenging to reuse. Do you handle them? John: Only if they are decorative or special, otherwise we don’t handle them. We have tested the market very well and they just don’t sell. DRN: Tell me about your family’s lumber mill Grossman’s Lumber? I understood they were dealing in reuse decades ago. John: My great grandfather and grandfather were very into reuse, which was strictly motivated by profit. They did some interesting work in Maine, including buying an entire town that had been decimated when an industry left. They redeveloped the town and helped bring industry back. Eventually they began selling kit homes during the housing boom. Grossman’s grew to be a chain of 100+ stores and was ultimately bought by another company. DRN: We use social media to promote our services and I actually found you because of social media. Do you blog or use social media for the business? John: We have a Facebook page and we share our posts on Twitter. We started a blog during the renovation that was pretty active, but we don’t have anyone who regularly blogs for us. We do use eblasts to stay in touch with our customers.